914 Alloys, aka "2-Liters" will spruce up any late model VW and give it that classic Porsche look. Gloss black with polished lip and spokes. Takes 60 degree style lug nuts. 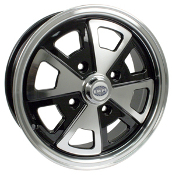 5.5"wide wheel has 4-1/2" backspacing and fits the late style VW bolt pattern: 4 lugs on 130mm. Comes with cap and chrome valve stem.